Boasting a mix of homegrown talent and All-Star signings, the 2009 Yankees comprised the best of the best, from young up-and-comers to future Hall of Famers. With the previous season's failed playoff bid still as fresh as the paint job on the new Yankee Stadium, a 27th championship flag represented the singular objective of a squad which would mend clubhouse fractures, witness scandals and redemptions, and ultimately carve out a unique spot among the Yankees' pantheon of World Series teams. It was the last title for the "Core Four"--Derek Jeter, Mariano Rivera, Jorge Posada, and Andy Pettitte--who would each retire over the course of the next five years. It would be the lone title for Alex Rodriguez, Mark Teixeira, A.J. Burnett, and Nick Swisher, each of whom saw memorable peaks and valleys during their time in the Bronx. 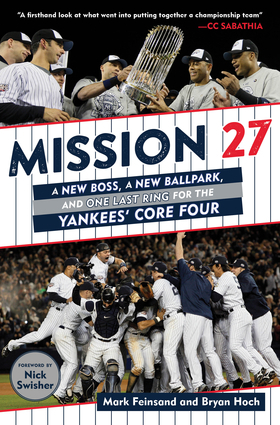 For CC Sabathia and Brett Gardner, it was their first championship, though the veterans were still in pinstripes as the latest generation of Yankees arrived for what they hope will be the next dynasty.Mission 27 is a thoroughly reported chronicle of an unforgettable season, packed with interviews with the full cast of key players, team executives, broadcasters, and more. Sportswriters Bryan Hoch and Mark Feinsand offer an unparalleled, inside-the-clubhouse account of both transcendent milestones and day-to-day deliberations on the road to October, making for a detailed and engrossing retrospective no Yankees fan should miss. Mark Feinsand is an Executive Reporter for MLB.com. He has covered the Yankees and MLB since 2001 for the New York Daily News and MLB.com and appears regularly on television and radio outlets including MLB Network, YES Network, and WFAN. He is the author of "The New York Yankees Fans' Bucket List," which was published in 2017, and contributed several pieces to the Yankees' official 2009 World Series championship commemorative book "Twenty-Seven." Bryan Hoch has covered New York baseball for the past two decades, working the New York Yankees clubhouse as the team's MLB.com beat reporter since 2007. He is the author of "The Baby Bombers: The Inside Story of the Next Yankees Dynasty," which was published in 2018. Regularly seen on MLB Network and heard on many radio stations throughout the United States, his work has also been featured in Yankees Magazine, New York Mets Inside Pitch, and on FOXSports.com.